Photo (Paderborn University, Johannes Pauly): The Advisory Board of Paderborn University on September 01, 2017: (form the left) Prof. Dr. Bettina Schiller, Prof. Dr. Rita Burrichter, Ralf Göttel, Dr.-Ing. Vera Denzer, Prof. Dr. Friedhelm Meyer auf der Heide, Chairman Dr. Dagmar Simon, Prof. Dr. Jürgen Brautmeier, Prof. Dr. Martina Schraudner, and Dr. Hans-Gerhard Husung. The Advisory Board as the central governing body of the university supervises the University Executive Board. It has to approve all strategic decisions as university development plan, economic plan and performance contract. The Advisory Board members are nominated for a five-year term. Currently four of the nine Board Members belong to the University, five are external members. Visiting researcher of the research group Science Policy Studies at Berlin Social Science Center (WZB). Honorary professor at Heinrich Heine University Düsseldorf. Professor of Practical Theology at the Institute of Catholoic Theology of Paderborn University. Senior engineering assistant at the Chair of Design and Drive Technology (KaT), Faculty of Mechanical Engineering, general manager of the Chinese-German Technical Faculty (CDTF) in Paderborn. Chief Executive Officer (CEO) of BENTELER International AG in Salzburg (Austria). Former State Secretary for Science and Research, Senate Departement for Education, Science and Research, Berlin (2004-2010). Former Secretary-General of the Joint Science Conference of the Federation and the Federal States (GWK), Bonn (2011-2016). Professor of Business Administration, especially finance and banking management at the Faculty of Business Administration and Economics at Paderborn University. Head of the Center for Risk Management (CeRiMa). Professor of Theoretical Computer Sciences at the Faculty of Computer Science, Electrical Engineering and Mathematics at Paderborn University, chairmen of the Board of the Collaborative Research Centre (SFB 901) "On-The-Fly Computing", member of the German National Academy of Sciences (Leopoldina) and the North Rhine-Westphalia Academy of Sciences and Arts. 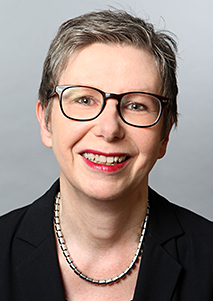 Head of the department of Gender and Diversity in Organisations at the Institute for Machine Tools and Factory Management at the TechnicalUniversity of Berlin. Head of the Center for Responsible Research and Innovation of the Fraunhofer Institute for Industrial Engineering (IAO) in Berlin.